Botany 2014 - new frontiers in botany! Need a Room or a roommate? Sign up for these informative workshops! Working with large datasets? Genomes, transcriptomes, image data? Thinking about publishing in journals? WS#10 Publishing in 2014: What Should Authors and Publishers Do? WS#1 Georeferencing Natural History Collections: A Crash Course in Translating Locality Data into Geographic Coordinates. 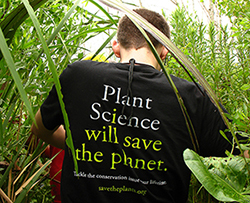 email: johanne@botany.org to sign up! For a preview - A Youtube Presentation! If you need a Letter of Invitation, email Johanne@botany.org with the title of your abstract, the abstract number and any special details that should be included in the letter. You will receive an email of the letter within 10 days of the request. Fees for Scientific Field Trips, Social Events, and Workshops are non-refundable if cancelled after July 1, 2014. Especially for Students - Register Now! Are you a member of one of our participating societies?